The Breakdown: Why Is the NRA So Powerful? Democrats have repeatedly conceded defeat on gun control issues and now would rather get out of the NRA's way than anger it. Christopher Hayes and Robert Spitzer investigate how the lobby came to hold such sway in Washington. For several years now, the National Rifle Association has racked up judicial victories while gaining the upper hand in the politcal war on gun control. This momentum is best summed up by this week's Supreme Court decision in the McDonald v. Chicago case essentially striking down Chicago's handgun ban and opening the floodgates for legal challenges to other gun control laws. The NRA's power over Congress is also something to behold. Democrats have repeatedly conceded defeat on gun control issues and now would rather get out of the NRA's way than anger it. They've even gone so far as to craft a specifically tailored exemption for the group from a recent campaign finance disclosure bill. So where did the NRA come from and how did it get so powerful? 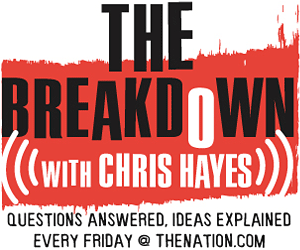 The Nation's Washington DC Editor Christopher Hayes and political science professor Robert Spitzer try to answer those questions on this week's edition of The Breakdown. For several years now, the National Rifle Association has racked up judicial victories while gaining the upper hand in the politcal war on gun control. This momentum is best summed up by this week’s Supreme Court decision in the McDonald v. Chicago case essentially striking down Chicago’s handgun ban and opening the floodgates for legal challenges to other gun control laws. The NRA’s power over Congress is also something to behold. Democrats have repeatedly conceded defeat on gun control issues and now would rather get out of the NRA’s way than anger it. They’ve even gone so far as to craft a specifically tailored exemption for the group from a recent campaign finance disclosure bill. So where did the NRA come from and how did it get so powerful? The Nation‘s Washington DC Editor Christopher Hayes and political science professor Robert Spitzer try to answer those questions on this week’s edition of The Breakdown. An op-ed by Prof. Spitzer for the Huffington Post about the Supreme Court’s McDonald v. Chicago decision. More background on Prof. Spitzer.